The 2018 Farm Bill signed by President Trump this week ushers in a new era for American agriculture; one in which industrial hemp is legal to grow again after a decades-long hiatus. And Montana farmers are taking notice. “It’s not quite as exciting as the day that I had my first child or my second child, but it is very similar in a lot of ways,” says John Porterfield with the Bonner, Montana-based Hemp Holding Company. Porterfield buys hemp from organic farmers and transforms it into a variety of products, including cold-pressed hemp seed oil and pellets for wood stoves. John Porterfield is with the Bonner, Montana-based Hemp Holding Company. “It’s like a big slippery baby has just come out across the table. Hemp is that baby and we’ve watched the birth of that industry today,” Porterfield says. Hemp is a hardy, fibrous crop that thrives in Montana’s climate. The Controlled Substances Act of 1970 classified hemp as an illegal Schedule I drug, which imposed strict regulations on its cultivation. Hemp legally can’t contain more than .3-percent THC, marijuana’s buzzy active ingredient. That’s not going to get anyone high, but farmers are betting hemp will put money back in their pockets. About 80 people gathered last week on the second floor of the Great Falls’ Times Square building to discuss the farm bill’s hemp provision. The Montana Farmers Union and state Department of Agriculture sponsored the meeting to discuss growing and harvesting techniques, the need for processing facilities, marketing opportunities and crop insurance. Justin Loch is the Farmers Union’s membership director. Loch says Montana farmers are looking for the next big thing and wonder if hemp may be that ticket. 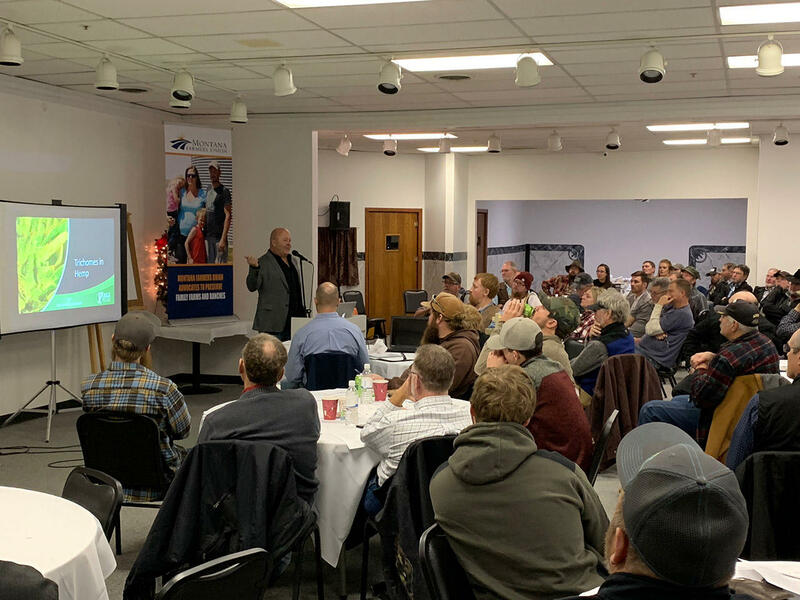 Farmers meet in Great Falls to talk about hemp production, December 2018. Hemp is a versatile plant that can be used in everything from concrete to textiles, but CBD is easily hemp’s hottest byproduct right now. CBD is shorthand for Cannabidiol. Brian Monahan co-owns a Missoula shop called Greenhouse Farmacy, which bills itself as a ‘cannabis lifestyle boutique’. It’s a certified medical marijuana dispensary that also offers a variety of hemp-derived products, including CBD. CBD advocates, like Monahan, say it can effectively treat everything from anxiety to cancer, but experts caution that there’s not enough research yet to back those widespread claims. Right now it only has Food and Drug Administration approval to treat two rare forms of epilepsy - and that’s it. This doesn’t deter sales. Monahan displays his fairly modest inventory of medical marijuana. "So here we have all of our different strains separated and weighed out into glass jars. Our cannabis side of things is very, very, very limited. It boils down to what’s in this closet." He points to the many displays and racks featuring various products including body balms, face masks, tinctures - even pet treats. CBD: three little letters than amount to big money. Cannabis market data firm New Frontier predicts this year’s roughly $400 million CBD market will balloon to over $1 billion by 2022. Montana farmers want a piece of that action. 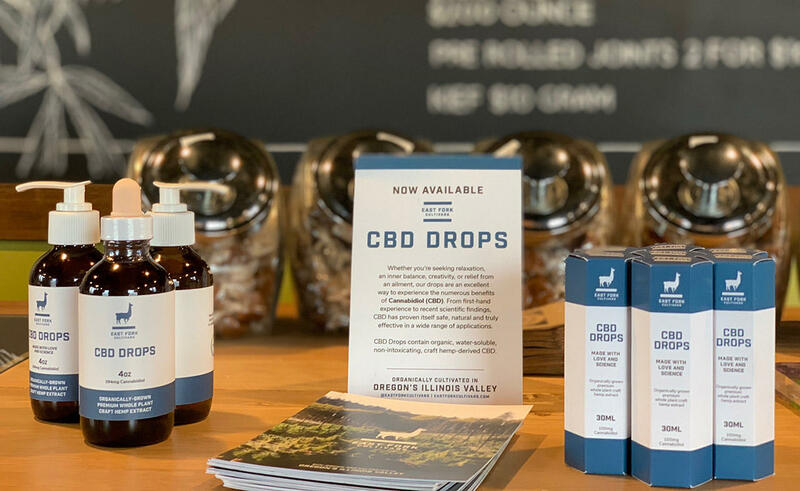 CBD products at a store in Missoula. Back at the farmers’ meeting in Great Falls, Ian Foley says his phone has been ringing off the hook. Foley manages the state ag department’s Hemp Pilot Program, which under close federal scrutiny, grew 22,000 acres of hemp last year, up from 550 acres in 2017. Foley says that makes Montana the largest hemp state in terms of acreage. Even though there’s lots of demand, he adds the industry is still in its infancy and finding markets for this year’s hemp crop will be a challenge. Cort Jensen is Chief Attorney for the Montana Department of Agriculture. “What that exactly means is going to make a lot of lawyers very wealthy," Jensen says. “We want to see more processing and opportunities and job creation in our communities. So, from my perspective, it’s a very bipartisan initiative," Jacobson says. No one who spoke with Montana Public Radio for this story seems worried about Canadian hemp flooding the burgeoning U.S. market. Canadian producers grew over 41,000 acres of hemp this year. The country is also actively expanding its processing facilities. 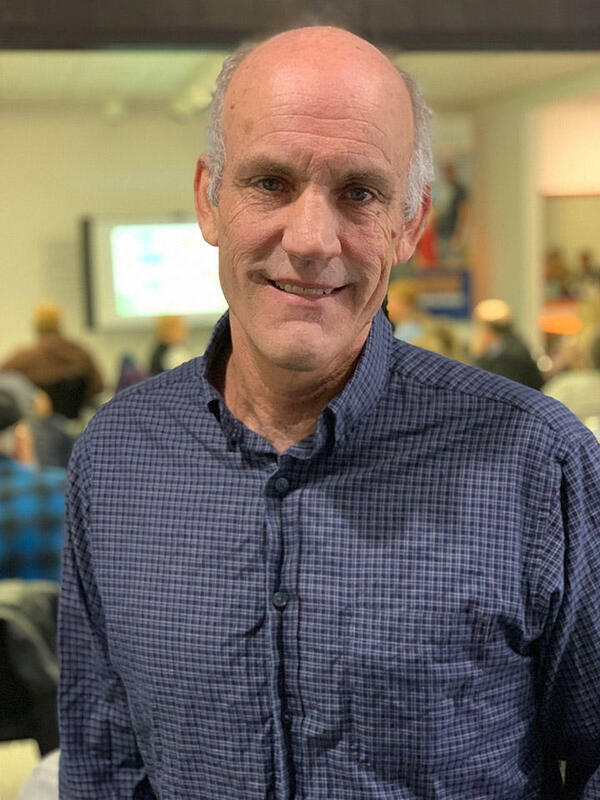 Jeff Brennan is an independent ag consultant from Joliet, Montana. “No matter how you slice the pie, we’re in competition with each other," Brennan says. But at the same token, I find that after spending a full year in Canada working with producers up there, their interest is working with us, and it's just like us working with them. Yeah, there’s going to be some competition, but that’s not a bad thing because we can work together and figure out that market even better." Again, the farm bill’s hemp provision represents the first major piece of federal cannabis legislation since 1970. Moving forward there are lots of uncertainties surrounding hemp in Montana, but the Hemp Holding Company’s John Porterfield sees enormous economic potential. Senator Steve Daines called the 2018 Farm Bill a win for Montana on a press call Wednesday morning. "Agriculture is our number one economic driver in Montana," Daines said. "The important outcome of passing the Farm Bill is that it provides certainty for Montana farmers and Montana ranchers in difficult times."